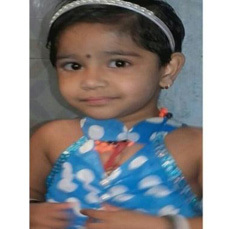 We request you to support 2.5 year old Bhumika Sawant. This child has undergone an Open Heart Surgery in Dec 2013 when she was just 2 months old. She is very enthusiastic and sweet Child who still needs to continue with medications. Bhumika’s father who is working as an office assistant hardly earns anything to fulfill the family needs and is running in financial crisis. Managing the cost of her education and medication is very difficult for him. He has a dream to educate Bhumika in an English medium school. Child Help Foundation depends on the generosity of individuals to offer help to Bhumika and educate this girl child and also help her to lead a healthy life with her regular medications.